1. Click Start, type cmd, right-click to select and run as administrator. If you are prompted for an administrator password or confirmation, type the password, or click Allow. 2. 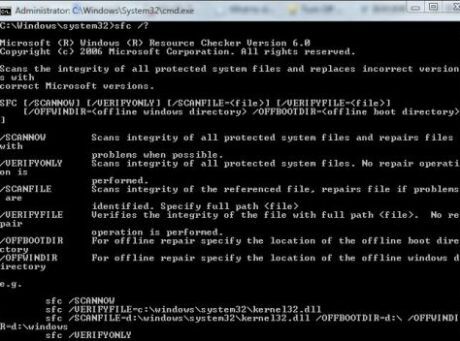 At the command prompt, type sfc / scannow, and then press ENTER: "Sfc / scannow command scans all protected system files and replace the incorrect versions with the correct Microsoft versions. 1. Open an elevated command prompt with administrator privileges. Note: Sfcdetails.txt file contains information about each time the System File Checker tool run on the computer. This file contains information about the file can not be repaired by the System File Checker tool, also the entries of verification date and time, to determine the file to find the last time you run the System File Checker tool. For example, type takeown / f E: \ windows \ system32 \ jscript.dll. For example, type icacls E: \ windows \ system32 \ jscript.dll / grant administrators: F.
For example, type copy E: \ temp \ jscript.dll E: \ windows \ system32 \ jscript.dll. The last note: in case any one of you type or copy the command wrong and thus leading the computer crash, it’s suggested to back up the data and files before doing any little modification.